Did you know fillers have many different names? Dermal fillers, soft tissue fillers or hyaluronic acid fillers (HAF’s) denote one and the same thing. The most commonly used fillers globally are made of Hyaluronic acid (HAF’s – Hyaluronic Acid Fillers) which is an essential and natural component of our skin and when this hyaluronic acid is synthetically processed and undergoes certain technological changes (converted to a gel form) its life in the skin increases as does its ability to gauge water. It’s a substance that is naturally present in our body, which attracts and holds water, the more it will be, the more plumper and youthful the skin looks. 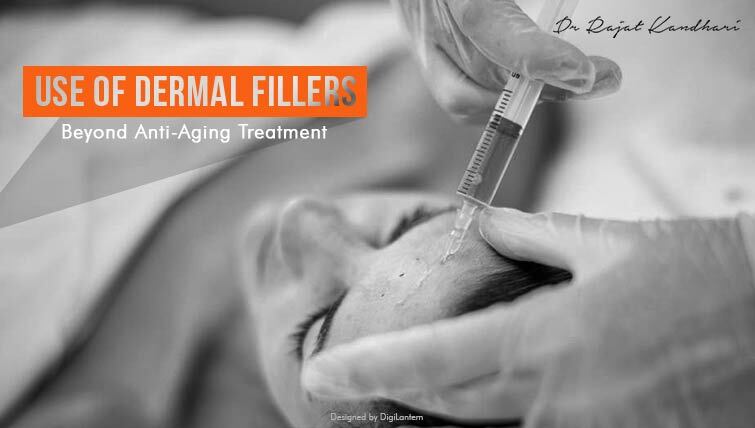 These fillers not only address your wrinkles or folds, but also provide a way to enhance your facial features in the form of structure and contour (fillers for augmentation). Moreover dermal fillers are virtually pain-free and safe if done by a skilled dermatologist. Moreover, if you don’t like what you see they are dissolvable. Cheek augmentation and contour – Frequently in my clinical practice i am asked “I want a LIFT to my face”, “I want nice, high cheeks” – These fillers help shape your cheek and give you the ideal “apple” of the cheek or the glamourous “ogee curve”. The results last for an year or more and more so the procedure is non surgical, safe and with minimal downtime. The requirement of the amount of filler varies from person to person i.e. a 35-40 year old may not require a lot of filler, whereas a person who is around 55 years of age with more volume loss may require more filler and may graded sessions. Chin and jawline shaping – Most people may not pay attention to the chin, although to achieve harmony and proportion to the face, restoring and contouring the chin is highly satisfactory for the patient and the doctor. Most Indian men and even women have recessed chins and these can be improved with soft tissue fillers. Further, addressing the jawline along with this gives you a nice and chiseled look. This may be combined with botulinum toxin and / or energy based devices for best outcomes. Beautiful eyes – The area around the eyes is most prone to aging and shows the early signs of aging. This gives the face a tired and sad appearance. Addressing this area with fillers helps to address the line below the eye and giving a freshness to the whole face along with decreasing the appearance of dark circles. Further combination treatment with botulinum toxin allows for widening the aperture of the eyes and combination of both treatments also help in giving an eyebrow lift desired by many women. Global rejuvenation – In my practice I call this the FACEcraft Program, wherein we address all the areas of the face and the smile (by designing and correcting imperfections with your dentition) to provide your beautiful face with proportion, harmony and freshness and more so a beautiful smile. This Program of course requires some time for things to come into shape. Just to look FRESH – These fillers can be deposited in the skin to provide a radiance and glow to the face depending upon the product we use. Contrary to the fillers used for structure and volume, these fillers are much lighter and gauge water thereby hydrating your skin and making it look party ready. a) Acne scars – Who would have thought an injection could help you do away with those acne scars? Yes, the hyaluronic fillers have been proven to effectively lessen the acne scars from your face. The results can be seen almost immediately after the procedure but the best part is that the hyaluronic acid continuously keeps working within your skin to depress the scars. So, the optimum results can be seen over a period of 10-12 months. b) Diminishing the visible fine lines around the neck – Dermal fillers are also being used by dermatologists to treat neck wrinkles caused by aging. It is the best option to improve the skin laxity which diminishes during to the process of aging. The use of fillers on the neck makes the ring like wrinkles by filling them up and the skin looks much smoother. This procedure is best combined with botulinum toxin or energy based devices. If you wish to know more about dermal fillers please feel free to reach out to us at info@drrajatkandhari.com.